The young woman known only as Rogue always has to be on guard, lest the slightest physical contact steal the mind and life of anyone who gets too close. In the alternate timeline ruled by Apocalypse, Rogue led the X-Men in the fight against tyranny. This is Rogue as she appeared in the Age of Apocalypse storyline. The body comes from a Monster Armor Rogue, and the head is a repainted White Queen. I was hoping that this would just be a simple head swap, but no luck - the MA Rogue's head was glued on (via its long hair) as well as pegged in. So after I had gone to all the effort of removing the White Queen's head, I ended up cutting off the disk and peg anyway. AoA Rogue stands about 5" tall and has the Big Five in articulation. Or would, were her head not glued in place. 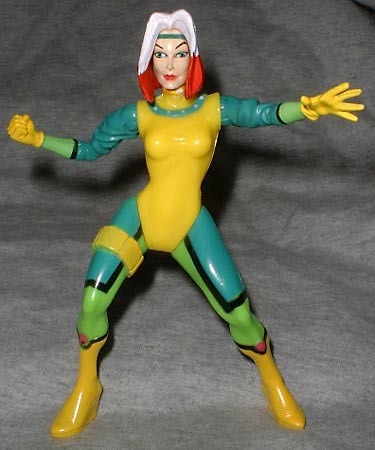 What's your favorite version of Rogue's costume? Tell us on our message board, the Loafing Lounge.